It is not particularly difficult to create attractively designed newsletters if you have the right program, but unfortunately that alone will not suffice if you wish to use newsletters as an effective method for selling products and services. In order to create newsletters for the purpose of increasing your sales there are many other factors you need to take into consideration if you wish to achieve a successful result. You must create newsletters in which the message is tailored to the recipients - both in terms of content, text and the design itself. These 11 tips will help you create newsletters that improve the likelihood of you increasing the sales of your products and services. 1. Should you create newsletters that are short or long? Nobody reads a newsletter they think is irrelevant. Consequently, you should always try to include the most important information at the start of your newsletter so that your offer or message is "crystal clear". An appropriate length for the newsletter depends on whether your offer or message can be communicated in a few lines, or if it needs to be complemented with additional information. There is nothing wrong with creating a long newsletter if it makes it easier for your customers to decide to buy something. 2. What does the content in your newsletters look like? We all receive a lot of advertising via regular ”snail mail”. There must be something special about a letter if it is to avoid being thrown directly into the waste paper basket. It might be something "hard" inside, for instance a pen or a sweet. Naturally, we still know that it is advertising, but if there is an object inside we become curious and open it anyway. A vital objective of the selling process is thus achieved, namely that the recipient has opened the letter. The same principle applies to e-mail, although in this context it is even more important because the amount of e-mail correspondence being sent is increasing all the time. Consequently, your newsletter must stand out in some way. Try to create newsletters that have a unique design. Use pictures that grab the attention of the reader. Or why not use sound? How often have you received a newsletter with a personal greeting that is relayed through the computer's speakers? 3. Can you create personalised newsletters? If possible, try to create newsletters that have a personal touch. You can do this by placing the recipient's name at suitable locations in the text, such as directly after a greeting (for example: "Hello Tony!"). You can even place the recipient's name in the newsletter's subject line e.g. "Important information for Tony Blair". Furthermore, you can also place the recipient's name at strategically important locations in the main text, for example: "Tony, we are sending you this e-mail because...". All these measures create a personal feel and significantly increase the likelihood that the reader will read your newsletter carefully. The reader will react if he/she spots his/her own name in the text, and curiosity will cause the reader to read the text more carefully. This is due to the fact that the use of names is still relatively uncommon in e-mail marketing, and because people have an ability to spot certain special words, including their own name, in a text - even if the text is very long. In order to be able to create personalised newsletters, you must use an e-mail program that allows you to use data fields in the newsletter's text. Such a program replaces the data fields with the recipient's name and other personalised details during an e-mailing, so that every e-mail recipient receives a newsletter that feels unique for him/her. The first thing your customer does when he/she receives your newsletter is to quickly scan its contents. Headings, subheadings and even a "PS" at the end should concisely and clearly summarise the content of your newsletter. The subject line and the headings should capture the reader's attention. They will determine whether he/she reads the remainder of your newsletter. Explain the primary benefit with your offer in a way that the customers can take directly to heart. Talk about the customer, not about you and your company. Make sure that you use words such as "you" and "your" instead of words like "I", "we" and "our" in the text. Use short sentences and simple words that make it easier for the reader to read the text. Write your newsletter in much the same way as you normally talk, and read your text out loud to yourself while imagining that you have the customer in front of you. Adapt the style of the language you use to suit the customer. Avoid using words and terms that the reader doesn't understand, because such words and terms will make the recipient of your newsletter feel insecure. Feel free to highlight important parts of the text in bold print. It is OK to start sentences with "And" or "But" if necessary. The most important thing is to achieve a text that is easy to read, and that quickly allows your customers to understand the message in your newsletter. More information is available in the article Useful tips for those of you that write your own newsletters. 5. Is your newsletter being sent to existing or potential customers? Giving them advantageous terms & conditions, for example "We offer a money back guarantee to any customer that is not fully satisfied with our product". Offering good warranties, for example "We exchange any faulty products free of charge within 24 hours". This shows that you offer excellent service and that you have a high degree of faith in your products. Offering advantageous payment terms, for example "Payment is due 30 days after invoice date". Making the customer an attractive introductory offer with a good discount. Using other well-known companies that are satisfied with your products as references. Highlighting the advantages you offer compared to your competitors. 6. How is the offer or message in your newsletter structured? Avoid trying to use too much "force" when selling, because offers that are "too" fantastic run the risk of seeming too good to be true. Be clear and credible and, above all else, ensure that you deliver what you promise! It is much easier to get a satisfied customer to buy again in the future than it is a dissatisfied one. Avoid using words that generalise too much, it is better to write "85%" or "9/10" than to write "many" or "most". But the offer or message in your newsletter must provide the customer with something special. You should highlight the advantages with your offer so that the recipient can see them from his/her perspective and can immediately realise the benefits involved with accepting your offer. If you have any direct competitors, make it clear why your particular offer is so good. 7. What should you do if your offer involves some sort of disadvantage for the customer? If your offer involves some sort of obvious disadvantage for the customer you should not try to hide that fact. Anticipate the customer's potential objections and meet them with sound counter arguments. Show why the problem isn't as big as it might seem, and explain how it can be resolved. Furthermore, highlight the benefits that compensate for the potential disadvantage with your offer. Being honest with the customer is also an effective way of increasing the credibility of your offer. 8. Why should the customer make a purchase at this particular point in time? Create newsletters with an offer or a message that is of a pressing nature, and impose a final date for placing an order. Remember that offers sent via e-mail have a shorter lifespan than those sent by regular post (people tend not to save newsletters), so try to get the reader to place an order as quickly as possible. You can do this by running campaigns that are of shorter duration than is normally the case with traditional letters sent by regular post. 9. 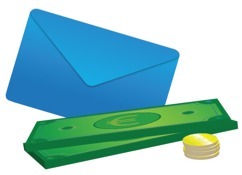 Does your newsletter include some sort of bonus? Give the reader of your newsletter something "extra". It could be some sort of promotional item, or a particularly good discount. Eveyone wants to feel special and to believe that they are getting a good deal. The bonus you offer should be the "icing on the cake" that means that your customer doesn't hesitate but instead feels that it is just as well to place an order at once. If you place your order today you will receive a gold pen into the bargain!" Surveys indicate that people read a "PS" surprisingly often, since they want to see who has signed the letter, and the "PS" is often positioned directly under the signature. 10. Who has signed your newsletter? The signatory is an important aspect of your newsletters. The sender's signature/name helps to determine the value, credibility and significance of the offer or message for the reader. Have you had most of the personal contact with the customer, or has someone else at your company been the customer's regular contact person? Ideally, the person seen to be the sender of the newsletter should be someone familiar to the customer. 11. Do you have someone who proofreads the text in your newsletter? Wait a few days after writing the text in your newsletter, and then read it again. All mistakes, ambiguities and careless errors that you didn't initially pick up will often be apparent the second time around, at which point they can be corrected. Let your friends and colleagues read your newsletter. If they say "It's fine" then unfortunately it is probably not very good. If they say "Do you really get a gold pen if you respond within 10 days?!" - then it's good!. You must get the people who proofread your newsletter to REACT to the content, and not just be polite; as polite is something that the recipients of your newsletter will not be! If you want to read more articles and tips about e-mail marketing and related topics you can follow us on Facebook or Twitter, or subscribe on our newsletter. You can also read our blog.